Urbana’s Emily Skelley fires a pitch to home during the first inning of Wednesday’s contest with Springfield. Skelley pitched three innings, striking out eight batters. The scoreboard didn’t work for opening day, and neither did the bats, as visiting Springfield defeated Urbana, 12-0, in five innings of non-league softball on Wednesday. Freshman Emily Skelley pitched well early, but errors allowed the Wildcats to scratch runs across early to pull away. None of Springfield’s runs were earned. Skelley finished with 8 strikeouts in three innings of work and was 1-for-2 at the plate. Makenna Radford was 1-for-2 with a double. Those were the only two hits of the game for Urbana. “I’m confident that we will be much better at the end of the season. We’ve got to be able to put the bat on the ball in timely situations. We have to make better contact. And you’ve got to stop giving them extra outs. You’re not going to beat anybody if you give them extra outs, and we did way too much of that tonight,” Pittsenbarger said. Urbana (0-1) hosts Bellefontaine on Friday, weather permitting. Urbana struggled at the plate, with Austin Rooney, Nick Weyrich and Gabe Spiers each going 1-for-3 to provide all the offense for the Hillclimbers. Spiers also started the game, going five innings with nine strikeouts. The Hillclimbers also dropped Wednesday’s non-league contest at Sidney, 10-0, in five innings. MECHANICSBURG – Mechanicsburg defeated Thurgood Marshall, 18-0, in non-league baseball on Wednesday. The Indians overpowered the hapless visitors, with Jake Edwards going 2-for-2 with a double, 2 RBI and 2 runs scored. Blake Sadowski was 2-for-2 with 2 RBI and 3 runs scored. Logan Hurst got the win, throwing two innings with 4 strikeouts. Mechanicsburg (1-0) hosts Northeastern today. SIDNEY – The Graham varsity boys and girls track teams raced at the Joe Ward Invitational. Having outstanding performances for the Falcons were the 4×800 team of Ryan Turner, Matt Flora, Payton McKellop and Tyler Callicoat. They came in second with a mark of 9:35. The 4×200 relay team of Zach Vanscoy, Ryan St. Myers, Tim Hughes and Tylar Bailey posted a time of 1:43 which was good for second place. Logan Brown earned 4th place in the 3,200 meter run with a time of 11:44. Zach Vanscoy took 3rd place in the shot put with a throw of 38-6 feet. For the girls, the 4×100 relay team of Machaela Whaley, Chloe Crabtree, Amber Robeson and Grace Nash took 4th place with a time of 57.3 seconds. Elise Kemp placed 4th in the discus with a throw of 81-9 inches. Bailey Magnuson took 4th in the shot put with a throw of 30-2 inches. 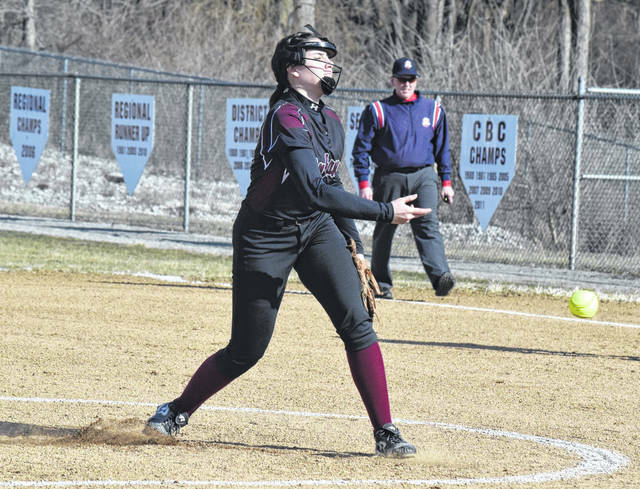 The Falcons’ next meet is at the Tecumseh Invitational this Saturday at 11 a.m.
https://www.urbanacitizen.com/wp-content/uploads/sites/36/2019/03/web1_EmilySkelley032719.jpgUrbana’s Emily Skelley fires a pitch to home during the first inning of Wednesday’s contest with Springfield. Skelley pitched three innings, striking out eight batters.